Research from the University of Guelph has shown that climate change has reduced spring flooding risk (exponential growth in frost-free days with more recharge and less snow pack / spring melt) and that summer flow changes are due to urbanization, not changes in precipitation. The presentation below summarizes the research and is entitled "Disentangling Impacts of Climate & Land Use Change on Quantity & Quality of River Flows in Southern Ontario" - the authors, Trevor Dickinson and Ramesh Rudra from the University of Guelph clearly see the need to clarify drivers for flow changes and to avoid the common media mistake of associating all extreme hydrologic conditions with climate change and omitting changes that may lower risks (like spring flooding in some watersheds).
" So … in Ontario urban watersheds: - urban development has augmented the winter and spring climate change impacts; and - summer flow volumes have increased dramatically, in volume and frequency, these impacts being completely due to urban development." The big take away is that urbanization is a key driver for summer river flows in Southern Ontario, but climate change is not - this is supported by trends in the Engineering Climate Datasets (version 2.3) that show twice as many statistically significant decreasing Southern Ontario trends as increasing ones. Summer maximum temperatures (middle chart) have NOT increased with climate change - Ottawa, 1939-2016. Changes in mean temperature are driven by changes in minimum temperatures. Those who point to the Clausius-Clapeyron equation and a greater water vapour holding capacity at higher temperatures as a driver for climate change-induced flooding in urban areas should reevaluate their position, and consider the data on maximum temperatures. Since there is no increase in summer maximum temperature at some stations, the cause of flooding due to extreme rainfall cannot be greater water vapour holding capacity of the air - as research at the University of Guelph has shown, urbanization and not climate change is the key driver for changes in river flow. 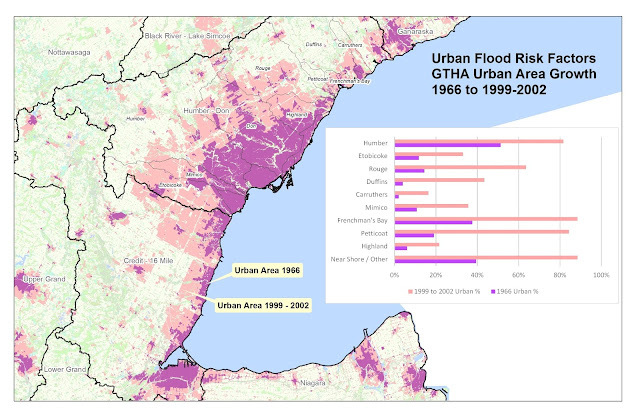 We can expect the same types of flow impacts beyond river systems and within municipal infrastructure systems, where urbanization and intensification have increases hydrologic stresses on systems even with no change to rainfall inputs. 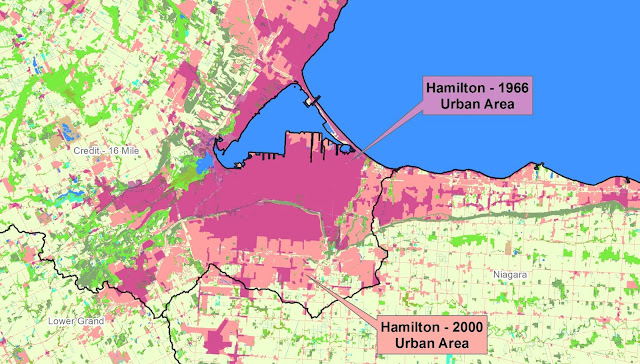 Hamilton winter temperature has increased the most due to climate change. Hamilton summer temperatures have increased at only a fraction of the winter increase. The Hamilton summer maximum temperatures increase (0.4 degrees in 40 years from 1970 to 2010) is only a fraction of the winter maximum increase (1.8 degrees in 40 years). The 0.4 degree increase in summer maximum would translate into less than a 3% change in water vapour holding capacity over 40 years. A review of research in another post has shown that temperature increases have not resulted in extreme rainfall increases across Canada - see post here. In the Toronto area, where the University of Guelph assessed changes in runoff and linked these to urbanization as opposed to climate change, growth has also been significant since the mid 1960's. The following table shows changes in Toronto-area watersheds where urbanization increased from 59% to 986% over a perido of about 35 years. Compared to theoretical temperature-induced water vapour changes changes of a few percentage, if any at all, urbanization clearly explains higher runoff stress and flood risk while climate change explains none of the risks.